Schwabmünchen, Germany: – Ritter Medical, the German-based manufacturer of sterile and technically advanced plastics for medical and research use, will exhibit its latest Ritips pro® range of syringes and advanced Ripette®pro manualliquid dispenser at next month’s ACHEMA exhibition. The Ritter team will be at Booth D25 in hall 4.1, and they will be happy to demonstrate Ritips pro’s advanced features. The new elongated Ritips® pro tips are ideal for use with long laboratory vessels. 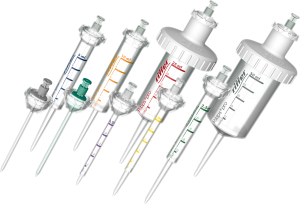 Ritips® pro are available in nine newly-designed standard and sterile variants, from 0.1ml to 50ml. Using direct displacement; the tips can handle viscous, infectious and volatile liquids with zero risk of contamination. The tips’ fine conical heads increase the precision, even at very low volumes in the nano litre range, eliminating need for additional pipette tips. 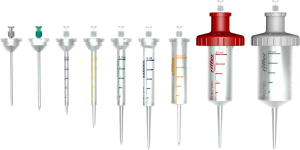 Ritips® pro fit all Ripette dispensers and are also compatible with most common mechanical and electronic brands, including Biohit, Rainin, and Eppendorf. Ritips® pro tips are individually tested to DIN EN ISO 8655-6 standards and manufactured to comply with IVD Directive 98/79/ EC. Independent laboratories have certified the sterile tips for purity and free of endotoxin, ATP, RNase and human DNA. Ritter will also show new generation liquid handling dispensers including the latest Ripette®pro, with clear vision display of volumes and dosing, advanced ergonomics, maintenance-free construction and freedom from need for additional power sources or batteries. “The Ripette® pro takes liquid handling technology to a new level of automation, precision and user-friendliness,” said Ritter Medical’s Melanie Wendel. “All in all, our new Pro range of liquid dose dispensers and sterile tips and needles set new international benchmarks for clinical-standard precision, ergonomics and hygiene,” she added. “We’ve had to think and work very hard to meet increasingly sophisticated demands from our customers in healthcare systems worldwide,” said Ms. Wendel. Ritter, founded in Bavaria in 1965 is today acknowledged, as is a world-class manufacturer of high quality plastics and “made in Germany” sterile laboratory equipment and disposables. Scientists and medical professionals in more than 40 countries rely on the company’s products. Ritter’s cartridge and medical products are particularly important in dialysis, dispensing and biotechnology applications. Many hospitals and laboratories also use Ritter disposables, dispensers and liquid handling systems. In addition, the company’s comprehensive ranges of sterile assay and sample handling containers, robotic tips and other specialized equipment make the Ritter brand highly respected in research and biotech laboratories. The company now employs more than 300people worldwide, including three European sales centers and in Jackson, Mississippi, USA. ACHEMA provides a World Forum for the Chemical Engineering and Process Industries. Attracting some 170,000 visitors from more than 100 countries, along with more than 3,800 exhibiting companies and organizations, ACHEMA is one of the biggest events in the sector. Now in its 31st year, the 21015 ACHEMA event will be held over five days, opening June 15th at the Messe Exhibition Centre in Frankfurt-am-Main, Germany. For the first time, the conference will focus on three major themes: Process Analytical Technology (PAT), Industrial Water Engineering and Bio based Production. Click on Ritter brings new Ritips pro range to Achema for more information. Click on Ritter to contact the company directly.